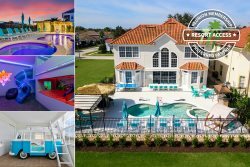 Beautiful rental vacation home located in the exclusive Solara Resort in Orlando Florida. Enjoy an excellent location within this gated community while making the most of your stay in this excellent home away from home. Modern architectural design in this open floor style home that has 9 spacious bedrooms and 6 bathrooms, finely equipped kitchen, games room, and private pool.